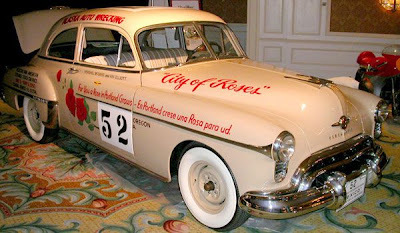 Chris recalled covering the Carrera Panamericana as a “foreign correspondent” with the Mexican government providing his transportation and lodging. Much of the transportation was via “a broken down DC3 with broken out windows.” The first Spanish word he learned was “disentario,” which many suffered until they started feeding from the Ford hospitality tent. He recalled watching Phil Hill and Richie Ginther cross the finish line of the first stage way ahead of everyone else “at what seemed like 9000 miles per hour.” He was also surprised at the huge attrition rate suffered in that first section, until he learned that Mexico and the governments of several south and central American countries had waived the customary 100-percent duty on imported cars for any car participating in the great Mexican road race. Many of the lovely new imported “race cars” simply left the starting line and drove right onto a boat. He also recalled one of the Mexican drivers skidding to a spin-out stop at the finish line and excitedly yelling for medical help. Not for him, but for his co-driver who had fallen out of the car at full speed 20 miles back. I knew Bill Sterling, He drove car no.38 in that race. He was a friend of my fathers. He used to tell us stories about it and how lucky he was to finish it alive. Think the 12 Hours of Sebring is tough?